[T]he blue pigment was derived from the rock lapis lazuli, a stone imported from Afghanistan of greater value than gold. Beyond a painter’s retainer, patrons were expected to purchase any gold or lapis lazuli to be used in the painting. Hence, it was an expression of devotion and glorification to swathe the Virgin in gowns of blue. The Bible readings for this feast day include Isaiah 61:10-11, Psalm 34, Galatians 4:4-7, and Luke 1:46-55. For the full readings see The Lectionary Page, but here are some highlights. The article noted that Mary’s song echoes several Old Testament biblical passages, including allusions to “the Song of Hannah” and from the Books of Samuel (1Samuel 2:1-10). Another note, “the Magnificat is included in the Book of Odes, an ancient liturgical collection found in some manuscripts of the Septuagint,” one of the earliest versions of the Hebrew Bible, or the Old Testament as we call it. (The word septuagent comes from the Greek word for 70, and refers to “the legendary seventy Jewish scholars who completed the translation as early as the late 2nd century BCE,” or two centuries before Jesus was born. 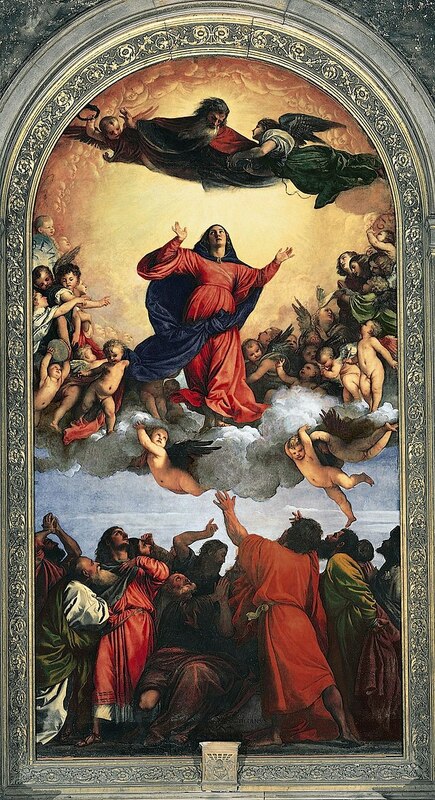 As to what happened to Mary, according to tradition she was taken “bodily” up to heaven at the end of her earthly life, as shown in the painting below. This entry was posted in Feast Days on August 16, 2014 by dorscribe@aol.com.